Science Education – Yoshimi M. Rii, Ph.D.
Professional Website: Ocean science, SciComm, Science Ed. When I took a Marine Biology elective class at UCLA, I was struck by the amazing wonders and truths of nature. From that moment on, I knew that I wanted to devote my life to exploring the mysteries of Earth. In order to leave Earth in better hands, it is our kuleana to engage our youth in our environment and to encourage them to become stewards of our planet. I support inquiry-driven, student-led, project-based science education. These are a few of the science ed-related activities I am/have been involved in. I am always interested in forging new collaborations! Contact me if you’d like to talk story. In collaboration with the Smithsonian Institution’s Youth Access Grant and the Hawai’i Institute of Marine Biology (HIMB), I worked as a Science Education Fellow to build three science education modules while mentoring undergraduate and high school scholars. The modules created through this grant consisted of a “Coral Growth and Survival” module which explored the growth of coral polyps over time, and a “Marine Biodiversity” module which examined biodiversity metrics using Autonomous Reef Monitoring Structures (ARMS). Currently in production is a “Marine Microbe” module exploring how DNA is used to assess microbial diversity in marine ecosystems. These science education modules focused on current ongoing research being conducted in Kāne’ohe Bay and oriented students towards traditional Hawaiian ‘olelo no’eau (proverbs), providing a unique form of place-based education for visiting school groups. For the past 3 summers, I co-instructed a summer course out at Moku o Lo’e, or Coconut Island (HIMB), for 24 high school seniors and recent graduates. We explored coral reef diversity, urchin fertilization, squid neuroethology, and ocean acidification. 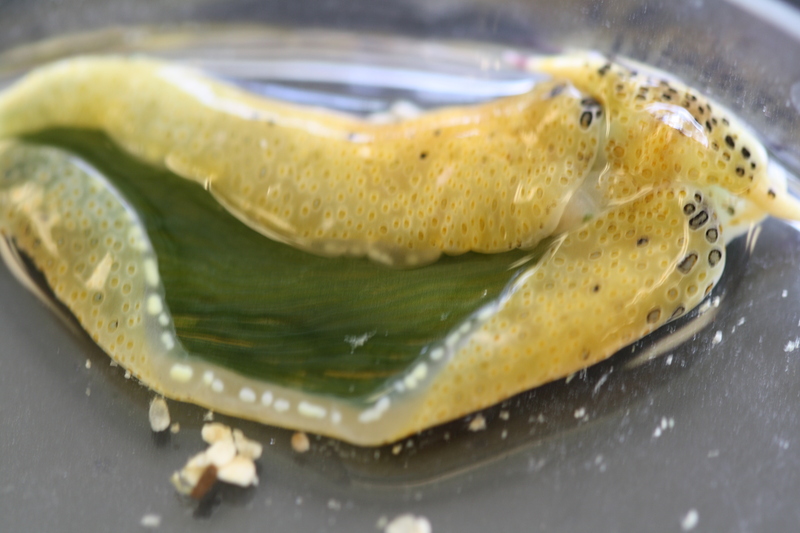 This past year, my group explored the chemotactic and phototactic behavior of the solar-powered sea slug Plachobranchus ocellatus. They are such fascinating creatures! through UH Outreach College. 9-12th grade students compared bacterial communities in nearshore and Waikiki Aquarium exhibit waters. Effectiveness of the course was presented as a poster at the 2014 Ocean Sciences Meeting in Honolulu, HI. For MBARI EARTH 2013, I taught K-12 teachers how to integrate real-time scientific data into their classrooms. I led a tutorial on the HOT-DOGS interactive data portal for the Hawaii Ocean Time-series program. From 2011-2014, I mentored 7 groups of AP Biology students on their Ala Wai Watershed Projects. Examples of past projects include examinations of nutrient stoichiometry on phytoplankton composition and identification of epibiont bacterial communities on kiawe and mangrove plants along the canal. In 2011 and 2012, I led workshops on marine science careers and how knot-tying is used in these various careers. Since 2013, I have served as a career mentor to a former Kapiolani Community College students who transferred to UH-Manoa this past Fall semester. The mission of the SOEST Maile Mentoring Bridge program is to recruit and retain Native Hawaiian undergraduates in ocean, earth and environmental science fields and SOEST degree programs through effective, individualized mentoring. I served as a research and career mentor to an undergraduate Global Environmental Sciences Major at UH-Manoa. I mentor her on the cyanobacteria-diatom symbiosis project and on research methods at sea. I co-facilitated the Mentoring Network, which brings together science mentors at different universities to share best mentoring practices in academia. We hold monthly Mentoring Webinar viewing events and get together to discuss personal and practice case studies. SEEQS is a public charter school that offers collaborative and interdisciplinary education to Hawai‘i’s middle and high school students. As a Development Team member, I helped to raise funds for SEEQS to continue to provide high quality public education in Hawai‘i. To date, I have helped to acquire 3 high-value grants (totaling ~$300,000) and 3 mini-grants (each ~$1000), in addition to fundraising through personal donations and events. From 2011-2014, I served as a panel member for the Center for Microbial Oceanography: Research and Education’s EDventures, a venture capital for educational activities. We followed National Science Foundation panel guidelines for evaluating proposals.